Kia Ora and welcome to New Zealand. It’s good to see you have allocated a solid 18 days to your trip around the North and South Islands of our beautiful country which should give you plenty of time to get out and explore some of the highlights. 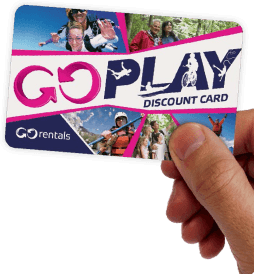 We want you to really get out and enjoy yourselves and hopefully your GO Rentals car will take you everywhere you need to go in comfort and style. These 18 days are going to be pretty full on but we have put plenty of restful and relaxing days into your itinerary to make sure you slow it down and strip back to the Kiwi pace of life. Enough of that though, we need to get you on your way so let’s GO! Wellington is small but has no shortage of things to see. Head for the CBD, park your rental car and wander around the small streets. After a day exploring our capital city, it’s time to give your new best friend a bit of a leg stretch and the drive out of Wellington and up to the Tongariro Crossing is a great place to start. The first stop of the day will be in the small farming town of Palmerston North. As you drive up the west coast, you may want to pit stop at any one of the lovely beaches on the way including Foxton, Otaki and Waikanae which are all easily accessible from SH1. Although it’s the biggest town between Wellington and Taupo, Palmerston is pretty quiet and this will give you a true insight into Kiwi life. With a plethora of cafes to pick from, this is a great place for morning elevensies – go on, treat yourself to one of those amazing looking muffins! Another quirky stop off on your way north is the ‘gumboot capital of the world’ – Taihape. The gumboot is the NZ equivalent of the Wellington boot and each year the town hosts Gumboot Day. If you’re lucky enough to be passing through in March, check it out and get involved in a bit of gumboot throwing – definitely one to tell the grandkids about! Your final destination for the day is at the start of the Tongariro Alpine Crossing, often described as the best one day walk in New Zealand if not the world. There are many places providing accommodation and a lift to the start of the trail which takes you up into the Tongariro National Park. The walk itself is 19.4km and on average takes between 7-9 hours to complete. It reaches altitudes of over 1800m and is covered in snow during the winter months. Make sure you book your return bus at the place you are staying – they will usually allow for a 10 hour day so people can take their time and enjoy the walk. So, a day out of your beloved hire car and a chance to stretch your own legs. The Tongariro Crossing is a must do on many people’s lists when they head to NZ so make the most of your day. The weather can change quickly out on the walk so make sure you pack for all seasons from the sun cream to the warm base layers – even if it’s a lovely sunny day when you set out, things can soon change out on the track. A gentle start to the walk will soon be replaced by some gradual climbs before the steep ascent to Red Crater where you get some amazing views looking down to the Emerald Lakes. Make sure you have your camera at the ready as there are so many photo opportunities on the walk. If you’re a Lord of the Rings fan (we won’t hold it against you if you’re not – promise!) then this is the place for you. Home to the sinister Mordor, you’ll soon start to recognise landscapes from the trilogy and a look over to Mt Ngauruhoe should bring flashbacks of the infamous Mount Doom. If you have the fitness and the equipment, climbing to the summit of Mount Doom is a possible add on to your day but be aware that this is a steep climb and should only be carried out by experience climbers. By the end of the walk, you’ll probably feel like Frodo and Sam so treat yourself to a big feed and a cold beer at the end of a great day. After a day off the driving, you have a big day ahead of you but it will be worth it with Auckland as your final destination. Here you can treat yourself to some gourmet food and drinks down on the Viaduct but let’s not get ahead of ourselves – there is a lot of adventuring to be had between now and mojito time. Heading out from Tongariro your day starts with a scenic drive around the shores of NZ’s largest lake to the town that shares the same name – Taupo. There is plenty to see and do in and around Taupo so definitely put aside a couple of hours on the way up to Auckland to explore. Although this is a guide to off the beaten track activities, it wouldn’t be right for us not to mention the amazing sky diving over Lake Taupo. As you will be aware, New Zealand is the adventure capital of the world and sky diving opportunities are abundant all over the country but Lake Taupo is a GO Rentals favourite and luckily for you, Taupo Tandem Skydiving is a GO Play partner giving you a 5% discount. The views as you hurtle out of the plane towards the lake are spectacular and if you can, we recommend you get the photo pack – it’s well worth the extra dollars to remember this day. For you budding Rorys out there, Lake Taupo throws up a challenge – can you land your ball on a green floating in the middle of the lake? If the answer is yes, and more importantly, if you can get a hole in one, your trip to Lake Taupo just got a whole bunch better as there are some big prizes up for grabs. Even if you don’t play golf, it’s pretty satisfying just whacking balls into the lake! 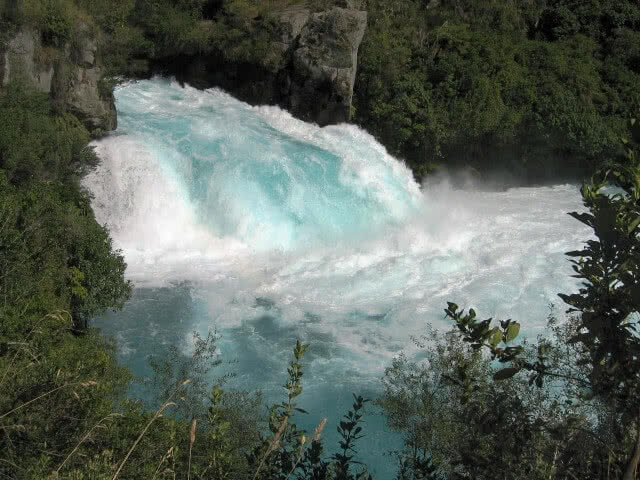 This is a great little detour as you head out of Taupo and well worth it as it’s not every day you get to see a river that is usually 100m wide get squeezed through a gap which is only 20m wide over a 20m drop! Apparently 220,000 litres of water gushes over the falls every second (that is a LOT of water) – we haven’t as yet managed to see any salmon leaping up the falls and we’re not sure it’s possible – what do you reckon? Heading out of Taupo, we avoid the obvious route up to Rotorua – we’re saving that for the way back down and instead head up SH1 towards Tokoroa. Surrounded by the Kinleith forest, it’s perhaps not so surprising that Tokoroa is a logging town with not a whole bunch going on. The thing we love about Tokoroa though is the man size portions of food served up in just about every eatery in town. Even their website doesn’t beat about the bush ‘No pretensions here; just honest kiwi hospitality and lumberjack-sized meals’ – lunch anyone? As you approach Hamilton, a great little stop off is the quaint little town of Cambridge. As the name might suggest, it does have an air of England about it and is a great place to take a stroll in one of the pretty parks. If you haven’t eaten yet, you can also get a mean pie in this town. The Pokeno store is renowned for the biggest ice creams in the country. Pokeno Takeaways, on Great South Road, will sell you a 15-scoop ice cream (yes, you read that right). Treat yourself. After this little stop off, you only have another 52kms to Auckland which should see you there in just over half an hour. Having arrived pretty late the night before, wake up to the sights and sounds of NZ’s largest city, home to 1.3 million people and known as the City of Sails. After a nice stroll in downtown Auckland, checking out the Viaduct area and maybe grabbing a bite to eat it’s time for a little trip out in your lovely hire car. A perfect place for a short run out is to head out west through the suburbs and out to the Waitakere Ranges With heaps of tracks through the lush forest, there is plenty to keep you busy here. If walking is not your thing, keep driving through the forest and end up at one of the superb west coast beaches like Piha or Muriwai. The surf’s good out there and the black volcanic sand makes for an interesting day at the beach. If you’re looking for something a bit closer to home but still fancy a drive out, head on out to Devonport or even up to one of the North Shore’s laid back locations like Browns Bay where you can grab a coffee and watch the world go by. There are so many things to do in the big little city that getting lost for a day won’t be a problem. Having only just got up north, it’s time to turn back and head down south again. Although there’s plenty to explore North of Auckland, your 18 day itinerary just can’t squeeze everything in. If you do manage to find some extra days, check out our guide to Northland which will give you loads of great ideas to plan a trip north. For now though, it’s time to head south on SH1 before heading slightly east on SH2 and SH27 towards Rotorua. should take you about 50 minutes. The drive down to Napier will take you back through Taupo so if you missed a skydive opportunity or that hole in one is still playing on your mind, you can always pop in but remember there is plenty to do in Napier and only a day to do it all! With so many things to do in Napier, hopefully you’ll have arrived in good time to cram it all in to one day (and the next morning – shhh!). Napier feels like a step back in time (even more so than the rest of NZ!) with its art deco facades and fountains so take your own step back, slow it all down and spend the day doing exactly what you want to do – you’ve deserved it. Hawkes Bay is one of New Zealand’s most famous wine regions along with Marlborough so it would be rude not to sample at least a couple of the local drops. If you’re feeling energetic, why not hire a bike and cycle between the vineyards – you’ll have truly earned your vino then! Te Mata Peak – offering some superb panoramic views of the Ruahine, Kaweka and Maungaharuru Ranges and Cape Kidnappers, whether you bike, hike or ride to the summit of Te Mata, it’s well worth the trip. For the more adventurous, you can even choose to paraglide back down to sea level. So, this is your last day in the North Island but there is still time to fit in some morning activities before heading back down towards Wellington to catch the Interlislander ferry which will take you over to your South Island and the second part of your epic NZ adventure. If you’re an early riser, try and head up to Te Mata Peak for sunrise – we managed it once and it was spectacular! After a leisurely morning in Napier, maybe exploring the Marine Parade, it’s time to hit the road as you need to get to the ferry. With departures leaving up to 8pm, be sure to leave yourself enough time to get to Picton and make sure you book in advance. We can help you out with things like that if you know you are on a tight schedule so check out our Travel Help section for more helpful tips. Although it’s a slight detour off the main route into Wellington, Martinborough is well worth a look if you have the time to spare. Martinborough has become the gourmet capital of the lower south island with 25 boutique vineyards and several fantastic restaurants serving delicious local produce. It may be a good shout for an early dinner if you’re catching the late ferry or lunch if you were up and off from Napier at the crack of sparrows. Be sure to leave enough time to get to the ferry terminal in Wellington – it’s around 80kms from Martinborough and should take in the region of 1 hour 15 mins but allow extra for traffic. After a day exploring in the Able Tasman National Park, it’s time to hit the road again and get a bit more familiar with your new GO Rentals car. The first stop of the day is not too far away however as you head out on SH6 towards the west coast. Enjoy the views along the rugged coastline as this is your last chance to take in the splendour of New Zealand’s West Coast – it’s soon time to turn east and head inland towards the lakes and mountains.Be sure to stop off for the walk down to Monro Beach just before you hit the Haast pass going east where between July and December it’s possible to see the Tawaki (Fiordland crested penguin). Make sure you cover up though as the venomous sand flies can be brutal at most times of the year. From here, your GO Rentals beast should be singing along as the road takes a meandering route through the Mt Aspiring National Park and on to Queenstown. Just north of the Makaroa Tourist Information Centre is a hidden gem (not so hidden since it made it into the top 10 things to do in NZ list!) for Kiwis and tourists alike. 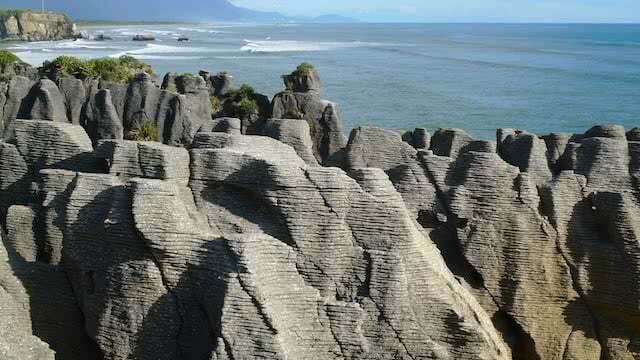 The Blue Pools walk can be accessed directly from the Haast pass and is well signposted along the route. Follow the track into the forest where you’ll find a series of crystal clear pools that have been carved out of the rocks by centuries of erosion. The glacier-fed water in these deep pools is the colour of deep azure blue, and so clear that you can see right to the bottom. Jumping in looks tempting but it is not advised as it will be a particularly cold shock to the system as well as upsetting the resident brown trout and you don’t want to mess with a brown trout unless you like a wet face slap. 3) Arrowtown (22.1km – 22mins) – head out in your GO Rentals hire car and check out this small town which was at the heart of the NZ gold rush. There are lots of nice shops, bars and places to eat as well as relaxing walks. At the end of a busy day, Queenstown is a great place to unwind with a huge range of bars to suit everyone. Depending on the time of year, you’ll either be welcomed in to a roaring fire or sit out enjoying the sun setting over Lake Wakatipu. 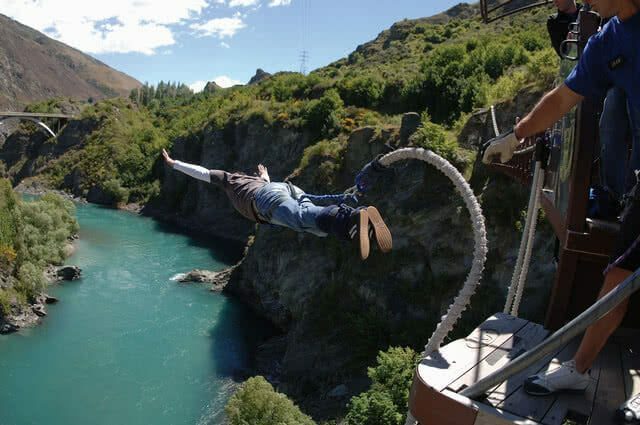 Check out our guide to Around Queenstown for plenty of ideas whether you’re an adventure junkie in search of bungy, rafting or maybe a trip up the gondola; there’s plenty to do for everyone. Due to its unique underwater environment, Milford Sound is home to species of black coral usually found at depths of 500m or more, including magnificent 300 year old ‘trees’ and the best way to check these old timers out is at the Milford Discovery Centre and Underwater Observatory. The Discovery Centre will send you on a journey back through the history, geology and wildlife of the Sound where you will also learn about the culture and heritage of this awe-inspiring place from local guides. So, you have made it to Christchurch, as you near the end of your epic kiwi adventure. Take the time to explore the ‘Garden City’ as you will have hopefully set off in good time from Lake Tekapo to enjoy an afternoon and evening before you need to head off to your next destination. The tree-lined Avon River and Christchurch’s many parks and gardens give the city its reputation as the Garden City so make sure you check out the botanical gardens and the beautiful parks. Check out the several projects that volunteers have created to temporarily “activate” sites left empty by the earthquakes – you’ll be able to see some unique and really creative work that is proof of Christchurch’s charm and resilience.